The rare sequel that is as good if not better than the original, this one has got it all. 22 Jump Street is a very enjoyable movie. It has all the same characters as the first film, and has our two heroes, Jenko and Schmidt, going off to college this time instead of highschool. once again it’s the two of them going undercover as students, trying to find and bust up an illegal drug ring that’s been going on. the boys again go their separate ways while at school, meeting two different sets of kids, but that’s where the similarities stop. This movie finds its own footing after that, and while the plot is pretty good, it’s the comedy that really makes the movie work. this movie is loaded up with jokes and most of them are extremely funny. 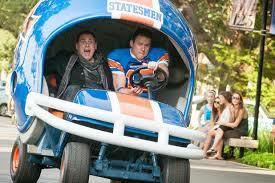 22 Jump Street is another very funny movie. The first film was great, and now so is this sequel. In fact, it is probably just as good as the first film. That doesn’t happen too often. Sequels tend to copy the original film’s formula or repeat jokes and end up either being another version of the same movie, or else they go the opposite route. Once in a while a sequel will try to be as different as can be to the point where it doesn’t even feel like it is part of the same franchise. 22 Jump Street is the movie that gets it right. That’s because it does not copy any individual jokes from the first film, but instead, finds it’s own new area to play around in. The storyline, when broken down to basics, is similar. 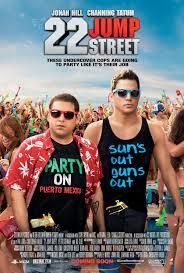 our two cops, Schmidt (Jonah Hill) and Jenko (Channing Tatum) are going undercover at school to bust up a drug ring. only here it’s college, not high school. They did a pretty good job in the last film to the point where now their department is staying opened, relocating to a new location, and getting all kinds of high-tech equipment. at one point the captain, played by ice cube, says it looks like something out of iron man in the church that has become their new base of operations. this church is across the street from the church they used last year, giving us the name 22 jump street. there’s even a funny joke about where they might be moving next year. the movie starts with scenes from last episode and with a quick review of some of the different moments that happened in the last film. from there, we get our first action scene with the two guys going in to a drug deal, attempting to masquerade under ridiculous sounding hispanic accents, and getting busted. it all happens when schmidt opens a box, expecting to find drugs and an octopus jumps out, latching onto his face. suddenly the boys start freaking out and accidentally forget to do their accents. once the accents go, their cover goes too, and a shootout ensues. the shootout turns into a truck speedaway with our two heroes grabbing on. by the end of the scene the truck has gotten away and our two boys are left hanging, literally. that puts them back in front of the deputy, played by nick offerman. he only had one scene in the first movie, and he’s really only got one scene in this film as well. this is the guy who sends them out to ice cube in the church. he tells them in this moment that nobody cared about them last year, but then they actually turned up drugs, to everyone’s amazement, and now they have some attention. but that doesn’t mean they can screw up and nobody will notice. he comments about schmidt’s octopus bite on his neck and then sends the boys off to the church. that’s when the real case begins. cube’s character, captain dickson, shows them photos of a girl who turned up dead on a college campus while buying drugs, and the boys get into some uncomfortable banter about her being black. schmidt makes the argument that the only reason he and jenko care about the case at all is because the girl is black, trying to kiss up to the black captain. jenko, on the other hand, insists that they would care equally whether she was white or black. the captain isn’t interested in what either one of them has to say on the matter and is the voice of reason, thinking the whole conversation is appallingly ridiculous. then jenko and schmidt head off to college. this part of their journey starts with them showing us a bunch of college accessories and explaining what each one is. then they walk down the hall of their dorm and start meeting other students. the two that they really exchange words with are a pair of twins who live across the hall and say everything at the exact same time. these two kids are hilarious together, and probably the funniest part of the entire movie. especially when they play rock, paper, scissors against each other later on in the film. like the last movie, this one does involve jenko and schmidt splitting up and meeting different groups of kids, but that’s just a way to run two plots at the same time instead of only one. it’s one of the few staples of this series that i expect to keep seeing in every jump street film that might come in the future. and this movie gives us good reason for the split, having both boys try out for the football team / fraternity, and only one of them get accepted. that person is jenko, the more athletic and better built. people laugh at the guys when jenko and schmidt tell them that they are brothers. they just look totally different in every way. and while jenko pursues his football status, making amazing plays on the field and also trying to follow a tatoo that was spotted in a photo of the deceased girl buying drugs, schmidt starts attending her classes. he makes a strong connection with a girl at the slam poetry class, and the girl happens to be the person who took on the roomate of the deceased girl to help her out with a tough time. schmidt ends up hooking up with this girl and then turning it into the start of a relationship. that all seems fine until a secret is revealed which unspools a massive amount of pent up comedy. suddenly the movie is given an extra edge which helps push it along. 22 jump street has a whole lot going on. it’s smart, just like the first movie, and that comes from some really strong comedic writing. there are scenes in this movie that talk about sequels and how they always end up trying to be like the first film, but not being able to pull it off. the nick offerman character gives them a speech about this. then there are tons of jokes throughout the film about jenko and schmidt being in a relationship. at one point the two of them even stumble into a guidance counselor’s office together and sit down for a session with him about their feelings toward each other. the action and criminal story is fine, just like it was in the first film, but the main reason this movie works so well is the comedy. even the end credit sequence, detailing future films of the series, is terrific. this is another winner.